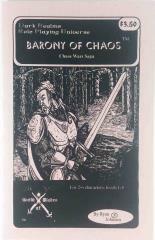 Barony of Chaos sets the characters in a chaotic adventure setting where the Lords of Chaos have used their infamous Chaos Gate to spread Chaos and mayham through the great Southern Empire, uprooting the entire empire and dumping it in the middle of a new and hostile world. In this setting the characters have the opportunity to attach themselves to a expedition heading into the Empire's far flung northlands, where the affects of the Chaos has reached a peak. The Barony of Chaos provides information suitable for a short adventure, but also provides background materials and maps that could allow a Realm Master plenty of oppounity to turn the information contained within into an entire adventure setting.